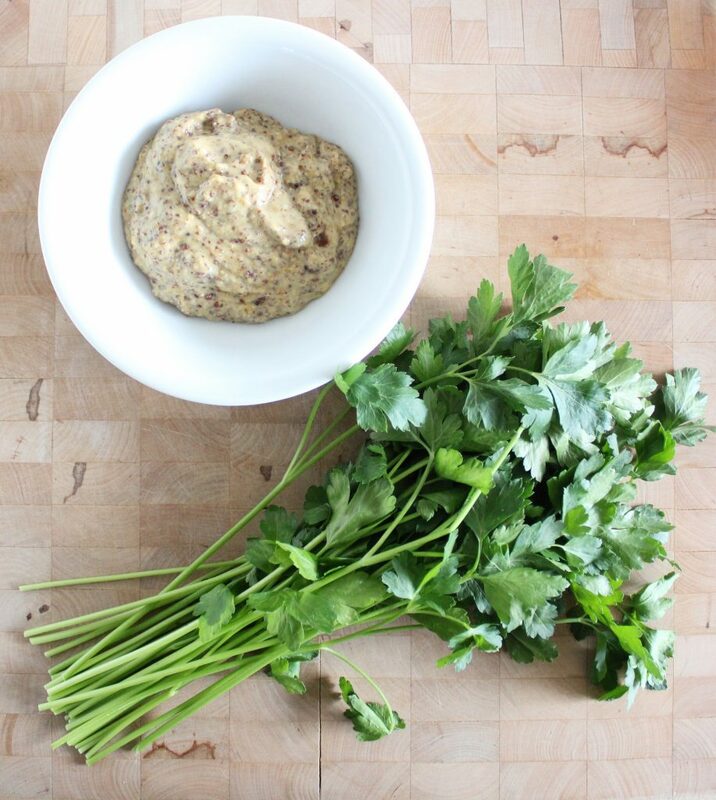 Once roasted we toss them with fresh parsley and a ‘honey’ mustard sauce. ‘Honey’ because it’s not honey that we use but mineral-rich dates, a whole food that I like to use as a sweetener/sugar replacement whenever possible. Along with the dates, we keep it pretty simple with raw apple cider vinegar (naturally fermented, good for digestion), lemon juice (vitamin c, real live freshness), grainy mustard (from the cruciferous family…something that’s easy to forget) (also! 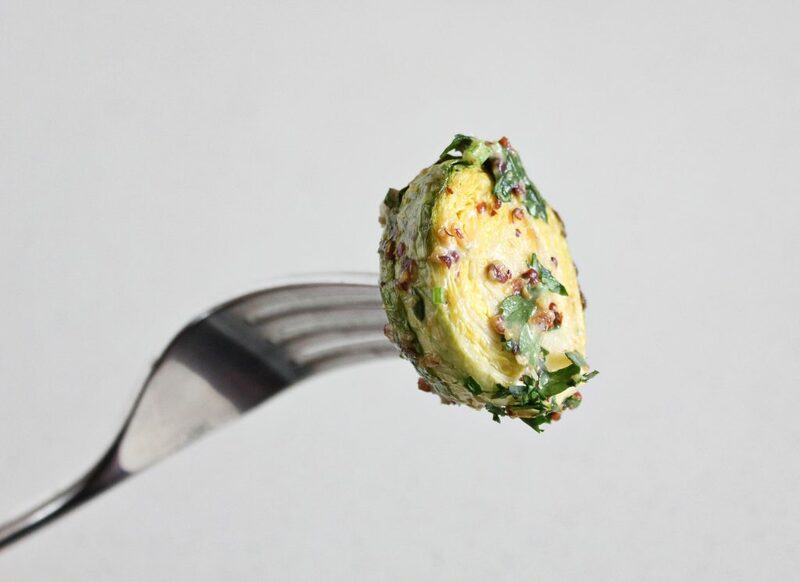 Use the Sprouted Broccoli Mustard for bonus points! 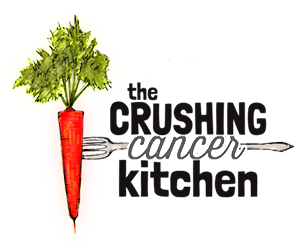 ), garlic (LOVES Brussels sprouts and hates cancer as much as we do), and extra virgin olive oil (not a great cooking oil, but great for adding after the cooking happens –precisely what we’re doing here). The parsley is important too. 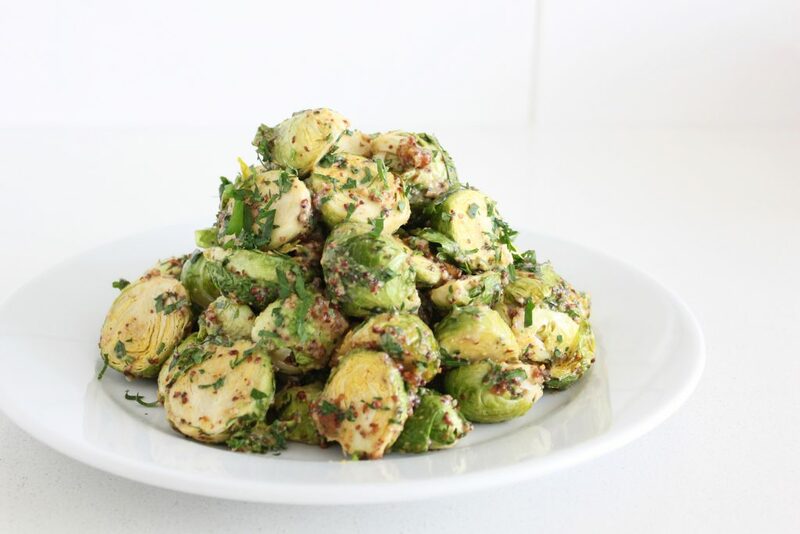 It reminds us how green the Brussels once were, adds their raw, feisty chlorophyll-rich grassy-ness and freshens things up, something even the Brussels sprouts themselves knows that they need sometimes. We mix this in a blender to break up the dates and garlic. Because mustard emulsifies things, it turns this sauce into a thick emulsion, like a very mustard-y mayo. 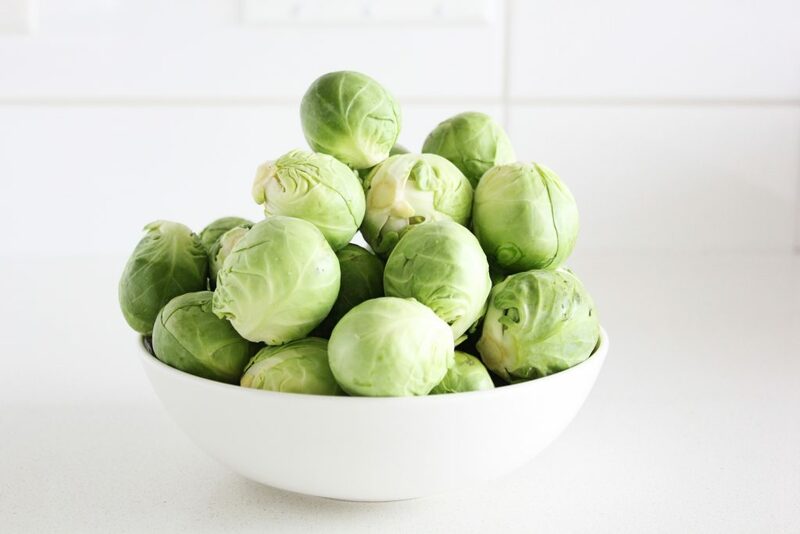 This adds some nice body that helps to coat the Brussels sprouts, giving them a nice roundness as it nestle into their many layers. 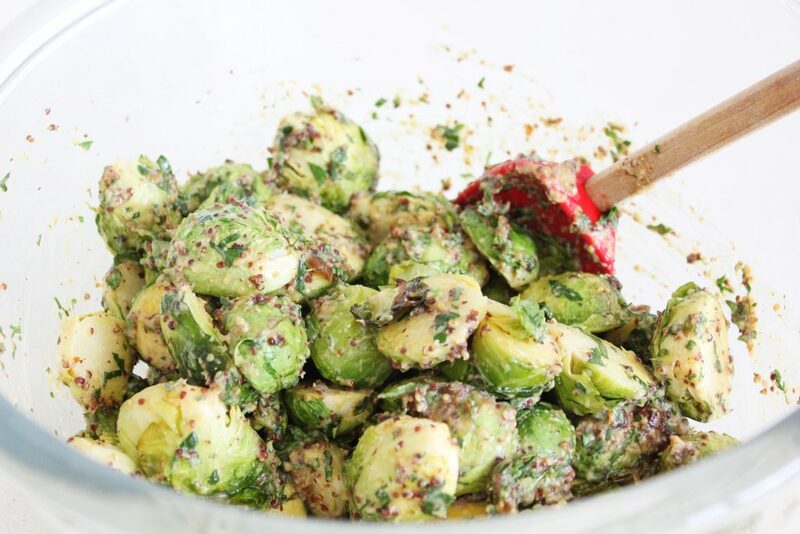 This sauce tastes amazing tossed with Brussels sprouts like we’ve done here (obvs) but it is a good way to add flavour to other things in a hurry too. Roasted carrots for example. 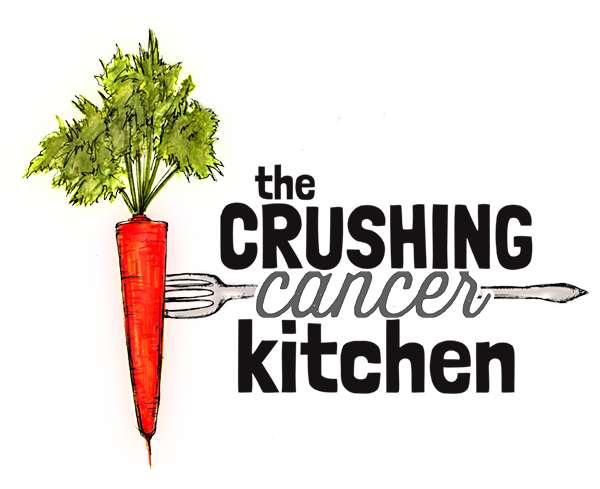 If you’re like me you probably have a bag of those just ok organic carrots in your fridge right now. The ones that you use once you’ve finished up all of the other veggies in your fridge. They would love a good roast and a dance party through this sauce. As a dip with for baked sweet potato fries, tossed with roasted beets, spread on a collard green wrapped around this amazing veggie burger, or this amazing veggie burger, or even just tossed with warm lentils, this is a great sauce/dressing to have on hand (or at least a good reason to keep fresh dates in your fridge). I ate most of these (my husband prefers them when they’re mostly burnt) (to be honest, I really like them that way too, but they’re kind of carcinogenic like that, so it’s just a sometimes treat) (I know, Brussels Sprouts for a treat, we’re wild), anyway, what I’m saying is I really liked them, enough to eat them every day for three days. They’re sweet, spicy and rich and vegetable-y but satisfying in a way that salad rarely comes close to. And I guess baby liked them too? I think they might actually be responsible for her growth spurt this week (stop growing so fast, baby!!!). Give them a try, let me know what you think! 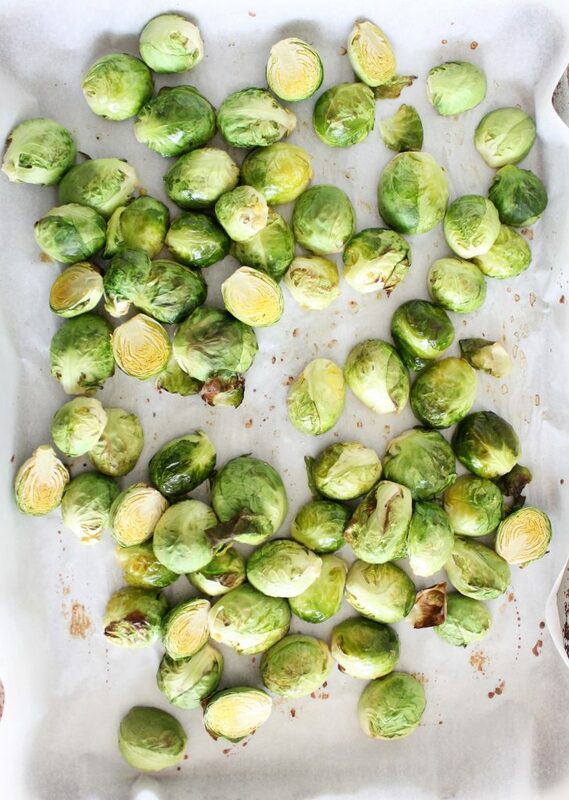 Wash the Brussels Sprouts, trim the ends off and cut them in half. 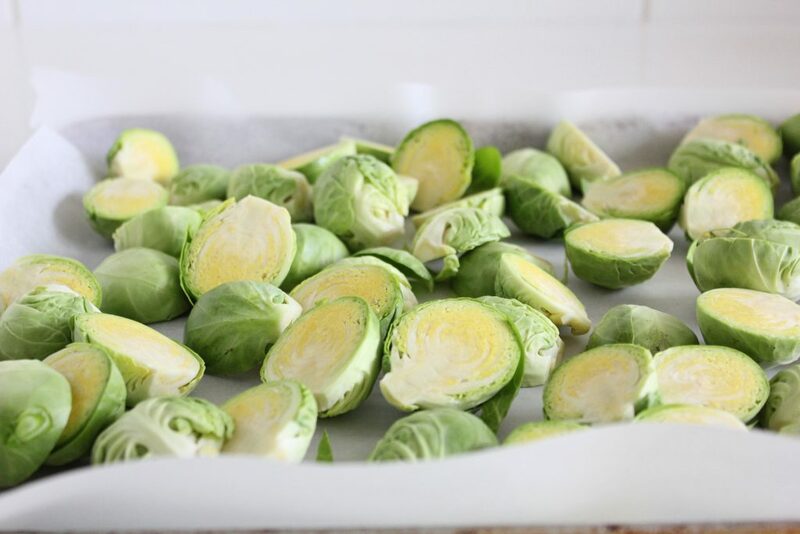 On a parchment-lined baking sheet, toss the Brussels in the coconut oil, spread out on a baking sheet and add the splash of water. Bake for 20 minutes or until desired doneness. 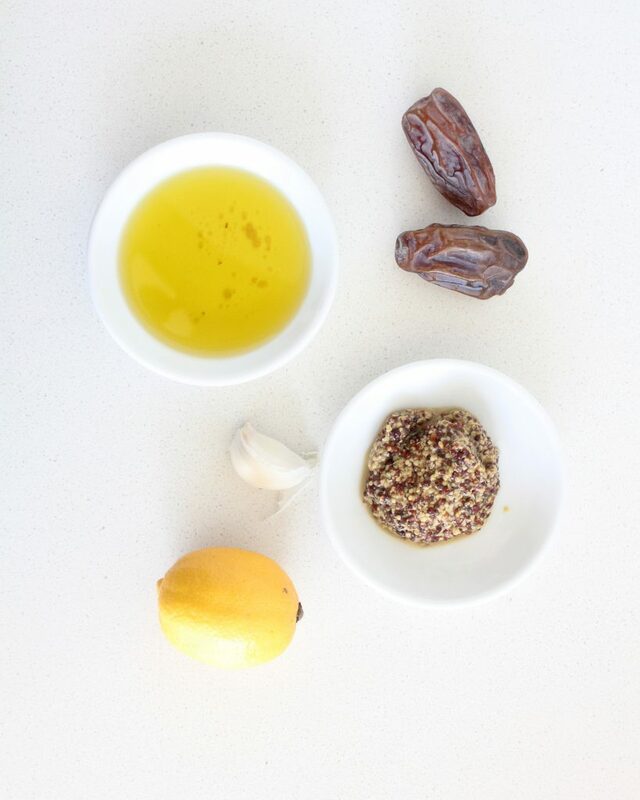 Meanwhile, blend the dates, mustard, olive oil lemon juice, garlic and salt until smooth. 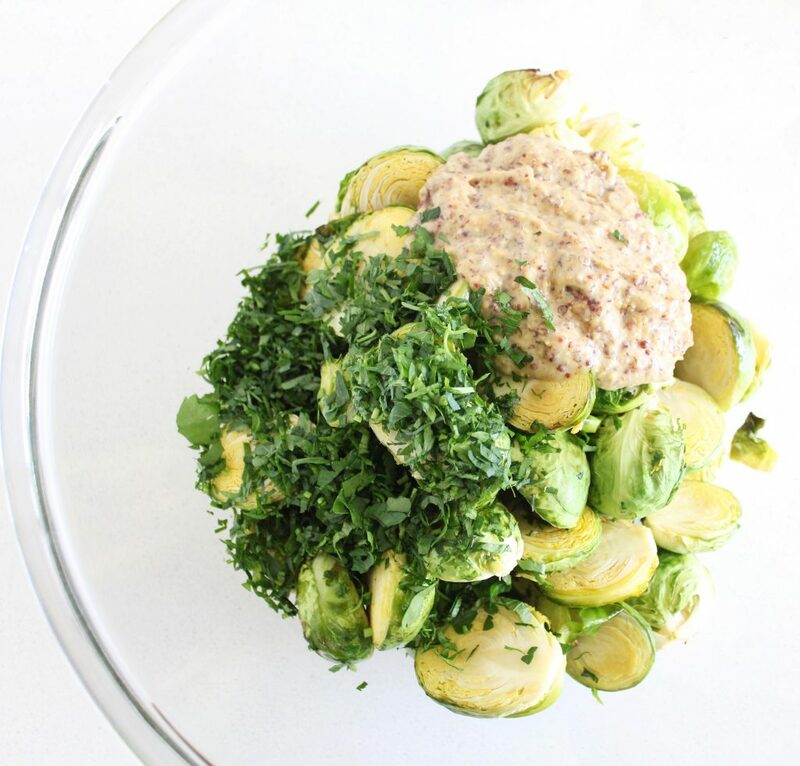 Toss with the warm Brussels sprouts and fresh parsley and serve. This goes well tossed with some lentils or beans if you want some added protein to make it more of a meal. Thank you! 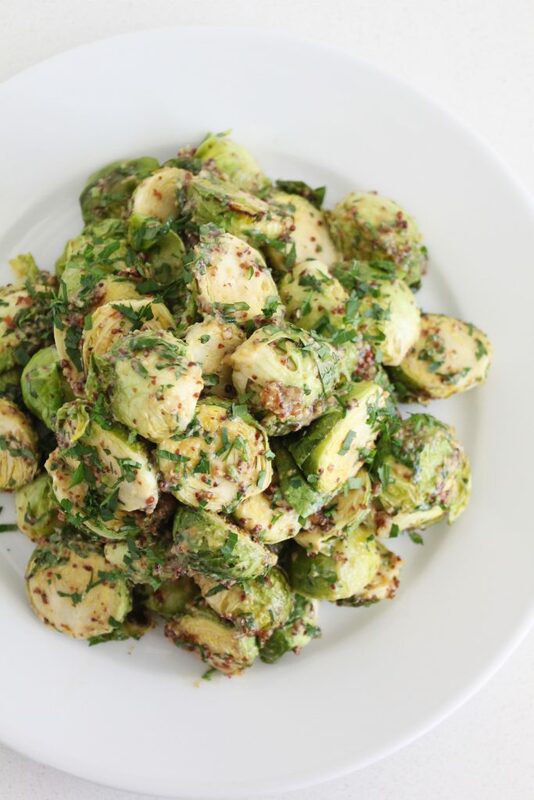 These Brussels are my fave, you’ll love them. Happy experimenting! the idea of dates blended with mustard to replace the usual honey mustard sauce makes me SO excited to experiment! love your recipes i am totally inspired :) :) Thank you!